Have you ever looked in the reflection or at an image of yourself and recoiled with a ‘THAT OUTFIT… what was I thinking’ reaction? Consciously considered or not, what we wear on the outside tells the world a little about who we are on the inside. When we experience disconnect between who we are and what we want to express, it can result in a visual miscommunication. This disconnect can leave you feeling style-confused, and might change the way that others interact with you or how you feel about yourself. Styling yourself sustainable isn’t necessarily about saving the world, it’s about creating a style plan you can sustain emotionally that considers environment, society and economic systems. The goal of Sustainable Styling is to have you feeling great about yourself so that you can pursue your daily life shining a bright light on the world. Let’s explore Sustainable Style the Sustainability in Style way. 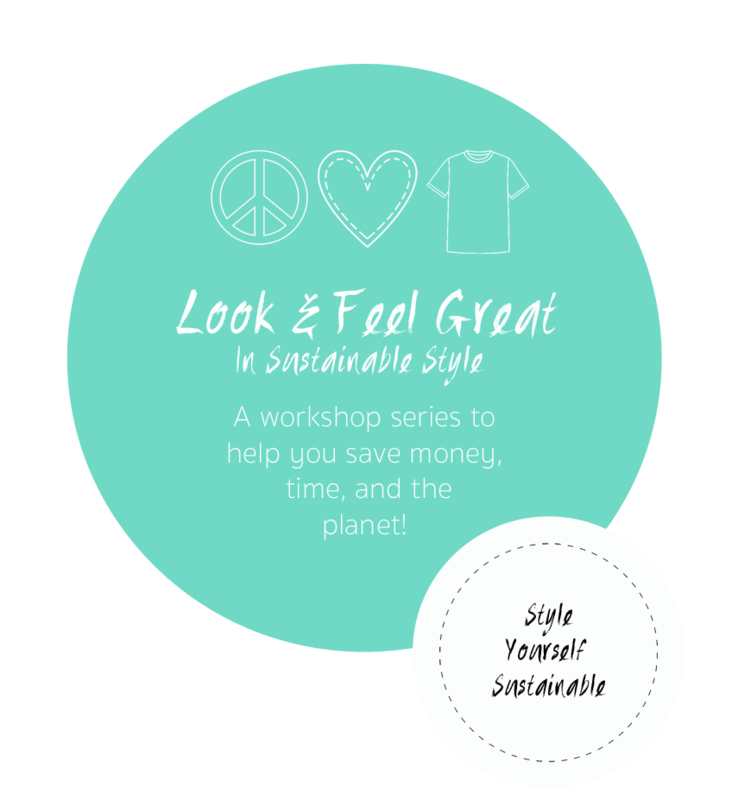 Content in this post comes from the Sustainability in Style ‘Look and Feel Great in Sustainable Style’ series. If you want all the knowledge, skills, and tools to be Sustainably Stylish check for a workshop near you. @ The Wellness Hub, Fernwood Fitness Maroochydore. Sustainability, as we hear it in the media, is presented with environmental movement as the central focus. However, for the purposes of this Sustainable Styling exercise we will shift the idea of sustainability back to its root word of ‘sustain’ and strip away the eco-living connotations. To look at what considered style choices and signature look we can sustain in our daily lives. Then build on this idea so that your style works better for you, your impact on the planet, and your hip-pocket. While there is a lot of debate about the offical definition of the term ‘Sustainability’ most can agree on the idea that it is the balance of environmental, social and economic (some also include governance) elements of human interactions with the planet. 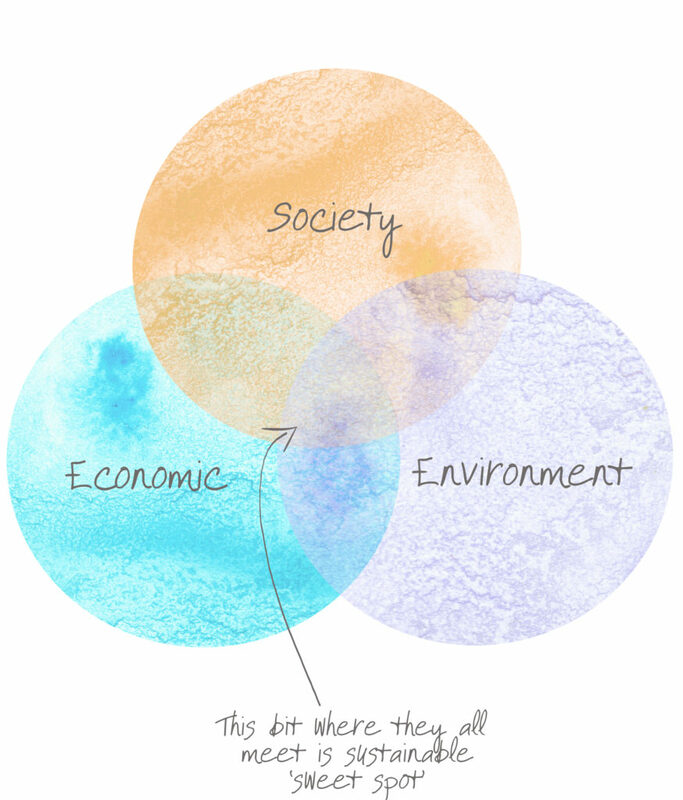 Sustainability is often represented as being the intersection between all three of these areas. Usually shown in the Venn diagram format seen below. Environment- What does environment mean to you in your style considerations. Think of your immediate environment (your closet, home, community, the weather… to name a few) and the extended environment (where your clothing comes from, environmental flows around clothing production, impact of wash and wear, clothing disposal). Society– What social considerations impact or influence your expression of Sustainable Style? There a social, gender and cultural norms to be considered. These could be large-scale social norms to consider, like living country where modesty laws exist, or more in-house social norms like your family tradition of dressing formal for weekend dinner parties. These all impact on what you wear and how you wear it. Economic– What economic sustainable style considerations do you have? These could include looking at the idea of bargain vs luxury, quality concerns, whether you are contributing to a brand or ideal you like or aspire to, if an item is an investment, and/or how much time you have to invest into your style. Dressing is an act of necessity. Cut back to the basics, we put clothes on in the morning to fit in with society (because getting around in the nuddy isn’t acceptable in most places) and to protect ourselves from the elements. However, we are complex beings with large brains that act as fast processing mechanisms. While we would like to think that people will see past our exterior to know who we are on the inside, more often than not the judgments are based on how we look on the outside in speeds too fast for our rational mind to keep up with. It’s really our subconscious mind that translates split second visuals and uses what we have in our mental filing cabinets and our gut to make first-impression decision about if someone is safe or dangerous to talk to. When we dress for our most Sustainability Stylish selves we consider the emotional response we will have with what we wear, and the response that we will get from people we interact with. There are a variety of ways of emotions and style can interact (which is why there is a whole workshop for it based in academic research) but these are a few tools that you can use to consciously communicate your insides on the outside. Drape commonly associated with fabric selection and tailoring. The drape of a garment or an outfit is the first part of a design process. Designers will drape fabric on a mannequin to work out what story they want their item to tell on the body. When you buy without trying an item on or knowing the brands sizes or the items fabric content you are taking a gamble, as what you see isn’t always what you will see on yourself. To use drape well, try items before you buy them to see if you get the look you were going for. Drape (combined with fabric selection and proportions) determines how an item fits on your body, figure hugging or loose or in-between. Colour is an alluring and important part of personal style and there are whole industries dedicated to colour analysis in fashion, marketing and personal style. Colour has impact on your emotions and the way that people around you perceive and interact with you. Use a fashion diary (provided in the workshop) to track what colours you are wearing and how you feel while wearing them. Become aware of colours that surround you in your home and in your closet. Consider using a professional colour analysis service to find out what colours suit your complexion. Take a course in colour therapy or research some resources online. Texture can add interest to an outfit, it can also add bulk to your proportions. A fluffy sweater will invite people to touch you, while a spiked collar might suggest you want people to steer clear. Be mindful of the language of both extremes. Choose wisely when shopping as some textures don’t suit lifestyles. A delicate knit for work wouldn’t last long if you were lugging an abrasive baby bag over it all day. The easiest way to reflect on proportion is to think of the male and female toilet icons. You know which is which by the proportions of their body and outfits. Proportion speaks volumes (literally) and is closely tied with societal norms, gender norms and body image. Spend some time considering the proportions or silhouette you want to present. Is it a socially acceptable version? Or do you want to test the boundaries of what is acceptable? Spend time experimenting with your silhouette. Know that you have body proportions (what you look like with no clothes on) and clothing proportions. You can use clothes to make your body a different shape. What shape do you like best? If the content you have read here has you wanting to learn more be sure to join a workshop near you or get in contact to enquire about having a workshop in your area.